An insider's guide to the perfect Summit ski day, week, or weekend. Whether you traveled halfway around the globe to get here or you’ve lived here since Tears for Fears ruled the world, the prescription for a satisfying ski or snowboard experience is the same: cram as much fun and challenge as you can into your allotted snow time. With that in mind, follow our local snow pro’s recommendations for the must-ski runs at each of Summit’s four world-class resorts—and one can’t-miss neighbor. If time is limited, squander your ski day in Breckenridge, where 2,908 acres and the county’s best above-tree-line terrain await. Like the Blue River, you’ll travel south to north, starting at the base of Peak 9. Head to the Falcon chairlift and zip down Cimarron, a former World Cup giant slalom run. Then take the Mercury chair to American and proceed to Peak 8 and the Imperial Express. Drop in to Whale’s Tail. Finish the day on Peak 6 with a hike to the 12,573-foot summit. Two days, two very different ski experiences, with one crucial trait in common: an abundance of stellar terrain. At Breckenridge, let the masses rush to Peak 8 while you explore Peak 9, mining all kinds of nooks and crannies for soft turns. The steep, north-facing runs under E Chair hold grippy snow well into spring, and Peerless has become an institution for intermediate skiers stepping up to harder runs. If it’s a beautiful day, hike out Windows Road to clear your head—and drop in wherever looks freshest. A-Basin may not have as many skiable acres as other county resorts, but it delivers the best bang for your not-inexpensive lift pass. Here, everything revolves around the iconic Pallavicini double chair, or Pali, which serves as a proving ground for Summit skiers. You can also cruise down the Basin’s low-angled gut from the top of the Lenawee chair and dabble in some backside fun in Montezuma Bowl. Soak in the small-ski-area culture. They don’t make them like they made the Basin in 1946, that’s for sure. There are benefits to picking a resort and staying there the entire week ... if you’re staying at an all-inclusive beach retreat in Manzanillo. 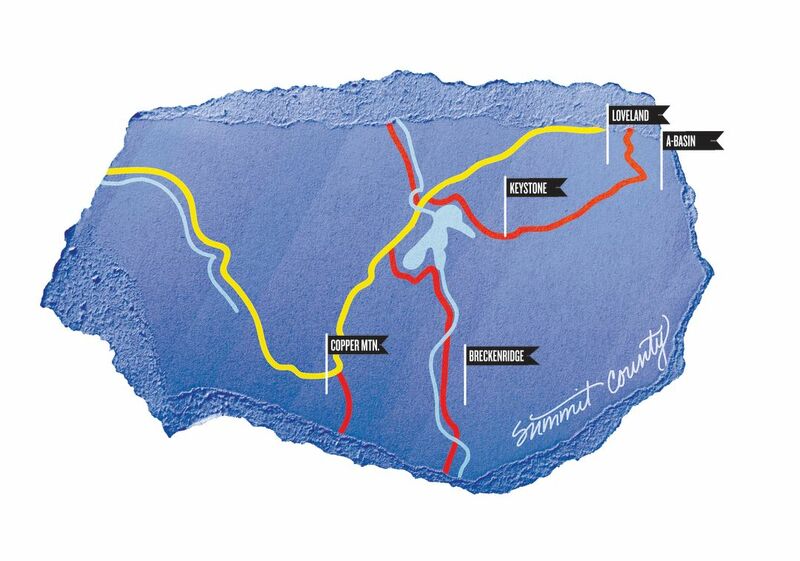 But your goal is to ski the best of Summit County, home to four world-class resorts, plus the sleeper people’s choice that is Loveland, just over the Continental Divide in Clear Creek County. So plan to sample them all, starting, again, at Breckenridge. If it’s bluebird with only a touch of wind, stay above tree line as long as possible. Hit Keystone next. The frontside runs under the River Run Gondola are long and undulating, a.k.a. a good warm-up for what awaits further back. Head to the Outpost and explore the Windows, one of the resort’s most prolific powder zones. Then spend Day Three at Copper Mountain, which has a cult following in Summit for a reason. It’s its own animal, west of everywhere else, with alpine bowls aplenty. Hit Spaulding, then Union, then Copper. Poke around the Enchanted Forest. Schuss down Main Vein on your last run. Finish your week at A-Basin and Loveland, which sit three miles apart from each other on opposite sides of the Divide, both treasures in their own right. Sometimes one does better with snow overnight, so follow Ullr’s lead. But, really, you can’t go wrong: they deliver two of the most authentic ski experiences you’ll have all season and, if for some reason you never return, perhaps even your entire life.